This Vernatone Oval horizontal mounted is designed where there is a limited height requirement. The Vernatone™ family of inline mufflers includes eight basic products with hundreds of variations in length, width, height, inlets and outlets. Builders and boaters requested these variations for specific engine or location requirements in a particular vessel. 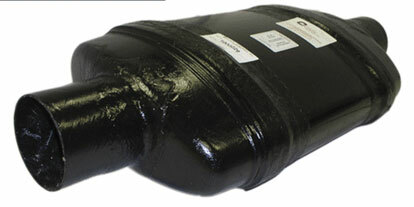 These mufflers also vary in size which influences the acoustical performance. Centek 1000139 Vernatone Oval Horizontal Mount Muffler 8"
Centek 1000194 Vernatone Oval Horizontal Mount Muffler 10"
Centek 1000229 Vernatone Oval Horizontal Mount Muffler 5"
Centek 1000263 Vernatone Oval Horizontal Mount Muffler 6"